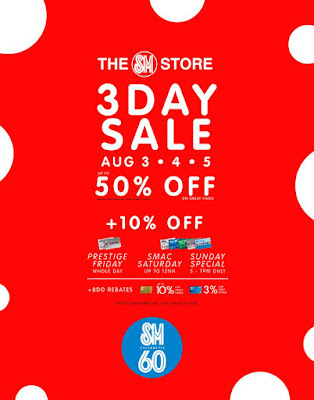 The SM Store 3-day SALE at SM General Santos, Masinag, Southmall, Sta. Mesa, and Tarlac happens on August 3-5, 2018! Get up to 50% off on great finds! PRESTIGE FRIDAY on August 3: Get extra 10% OFF on all* items, whole day, with your SM Prestige, and BDO Rewards Diamond card. SMAC SATURDAY on August 4: Enjoy extra 10% OFF on all* items, up to 12nn, with your SM Advantage, SM Prestige, BDO Rewards, Mom, Primo, Love Your Body, and SSI cards. SMAC SUNDAY SPECIAL on August 5: Get extra 10% OFF on all* items, 5pm-7pm, with your SM Advantage, SM Prestige, BDO Rewards, Mom, Primo, Love Your Body, and SSI cards. SMAC EXCLUSIVE: Buy an Orbik Mosquito Killer for only P699.75 (30% OFF) with a minimum P2,000 single-receipt SMAC purchase. PLUS, get a chance to win one (1) HUAWEI P20 LITE + one (1) Globe Prepaid Home Wifi with every P2,000 single-receipt purchase.